How do i move from coal to biomass boilers? 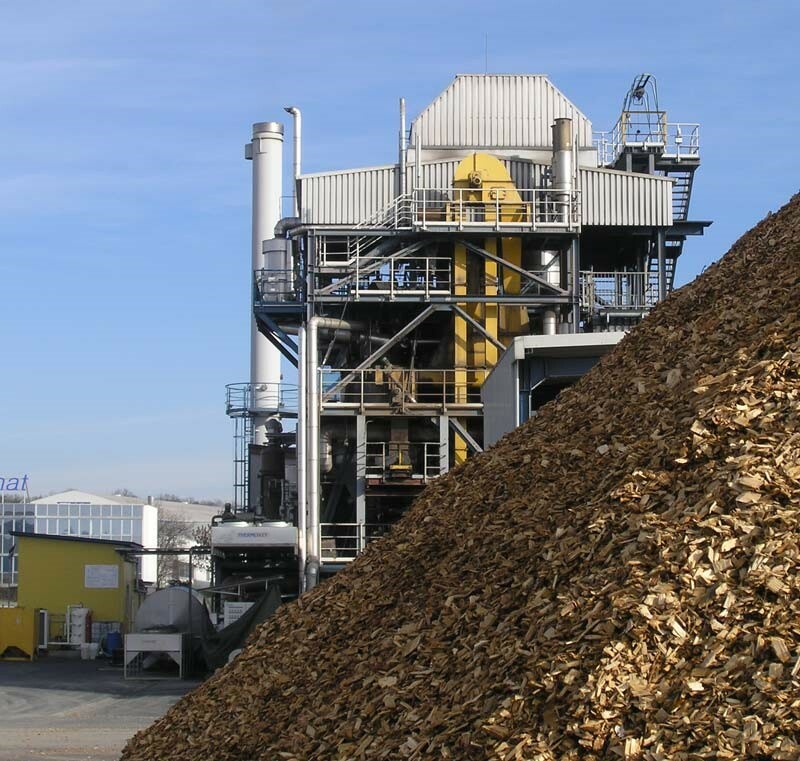 what are the uncertainties that arise while using biomass? 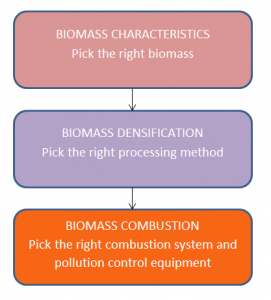 The following page is a guide and selection tool that enables you to pick the optimal biomass, processing method and boiler to help ease the process. We have split the task into three stages: first to understand the characteristics to look for in a given biomass, second to pick the right processing method for the ease of transportation and storage and third to pick the appropriate combustion system and pollution control equipment. Availability and Distance of provider: The primary selection criterion for the biomass has to be the availability and distance of the supplier from the plant. The biomass fuel has to be available and in close proximity to the biomass combustion plant to be set up to reduce transportation costs. weight during transportation and causes storage problems. Ash Ash is the incombustible solid mineral matter in a fuel. which causes slagging and fouling on boiler surfaces. From the above table we identify sugarcane bagasse as our best option as it has a higher calorific value, lower ash content, low Nitrogen, Sulphur and Chlorine content, less Silica and Alkali values in its ash and has a good enough base to acid ratio and fouling factor. Pellets: Pellets are very dense, cylindrical with a diameter of 6-8mm and a length of about 38mm. They are produced through an extrusion process using a piston press. Briquettes: They are similar to pellets but not as densely packed and much bigger in size with a diameter greater than 25mm. Briquettes are preferred for plants with lesser capital and semi-automated fuel feeding systems as the combustion performance is good enough and transportation and storage costs are reduced compared to using loose biomass. For plants with more capital, pellets are preferred as they can be used in fully automated systems and have a better combustion performance but briquettes can also be used as a less optimal substitute. 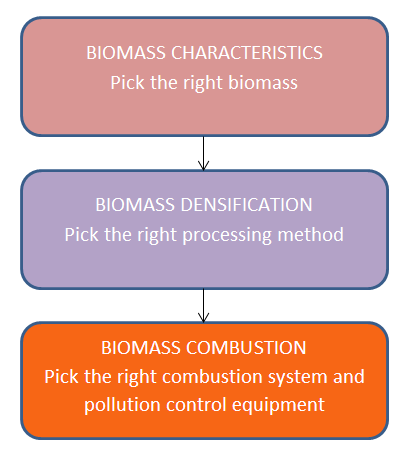 Once the right biomass fuels have been narrowed down and the densification process has been selected we must then move to the third stage of selection that identifies the appropriate combustion system, condenser to be used as well as the pollution control equipment to be used. Grate Furnace: The combustion of the biomass occurs on a grate with a primary air flow underneath the bed and the combustible gases produced are burnt with a secondary air flow. These systems place the fuel on a grate and the ash produced is disposed off automatically. It has a few types such as fixed grate, moving grate, travelling grate and vibrating grate. low ash content and small particle sizes, hence grate furnaces are preferred. combustion chamber. Hence this system is not preferred. Bubbling FBC: This system fluidises the bed through a perforated distributor plate and the heattransfer tubes are placed in the bed as well as in the convection zone before the flue duct. Hence out of the above combustion systems grate furnaces and fluidised bed combustion are most widely used. We shall therefore compare the characteristics of grate and FBC systems. Fuel Size Any fuel size can be used. (Pellets/Briquettes/Loose) Pellets are preferred but crushed briquettes can also be used. Pellets are preferred but crushed briquettes can also be used. For a high alkali fuel and a plant capacity below 20MWth a grate furnace is preferred. For a low alkali fuel and a plant capacity below 30MWth a bubbling FBC is preferred. Cyclone separator: Particulate-laden combustion gas is forced to change direction; and gets separated from the gas stream due to inertia of the particles. They have a low capital cost, low maintenance but are not very efficient in collecting fine sized particulate. Baghouse Filter: This device utilizes fabric filter tubes or a cartridge to capture fly ash and other particulates from the combustion gases. They have high collection efficiency and can withstand most flue gas flow rates but they get damaged at high temperatures, cannot handle corrosive gases and cannot filter moist gas streams. Wet scrubber: High-energy liquid spray is used to remove particulate and gaseous pollutants from the combustion flue gases. They can withstand high temperatures and high particle loading as well as explosive gases but are prone to corrosion and the scrubbing liquid can pollute water. Electrostatic precipitator: This is used to remove very fine particulates by inducing a negative charge to the particles and collecting them on a positively charged or grounded plate and are very efficient (usually more than 99%). They have a very high efficiency and can handle any flow rate of flue gas but they are expensive to install and have high operational costs due to the amount of electricity required. ESP can used where high capital requirements can be mat as it has a very high efficiency. Cyclones can be used to save capital cost in small scale plants. Wish to Recruit Boiler Experts ?